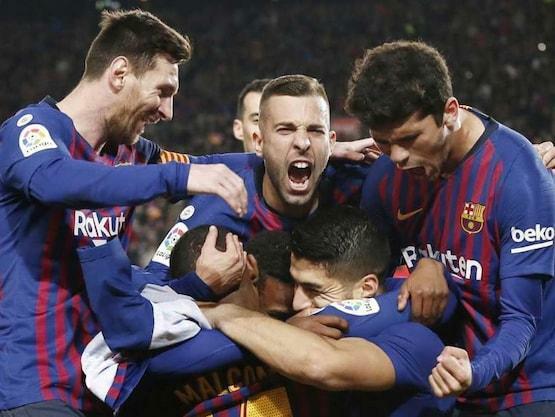 Luis Suarez and Lionel Messi scored twice in two minutes as Barcelona broke the resistance of 10-man Atletico Madrid on Saturday to go 11 points clear of their La Liga title rivals. Diego Costa was sent off in the 28th minute at Camp Nou after insulting referee Gil Manzano but while Atletico Madrid held on for almost another hour, Suarez and Messi struck late to seal a pivotal 2-0 win. The victory leaves Barcelona almost out of sight with seven games left to play and maintains momentum ahead of Wednesday’s trip to Manchester United in the first leg of the Champions League quarter-finals. Manchester United coach Ole Gunnar Solskjaer was in the crowd along with his assistant Mike Phelan but this was a familiar story of Barcelona’s deadly duo delivering when it mattered most. Suarez intervened with a superb long-range strike in the 85th minute, before Lionel Messi added a second in the 86th. The pair have now scored 53 league goals between them this season while for Messi, this was a record 335th La Liga victory.